Thanks for helping spreading the word about CKB! I bought a tablet to try drawing digitally-and so far I'm not in love (so the pics are still pen and paper...) If anyone has any experience with drawing tablets or software for digital drawing--let me know! 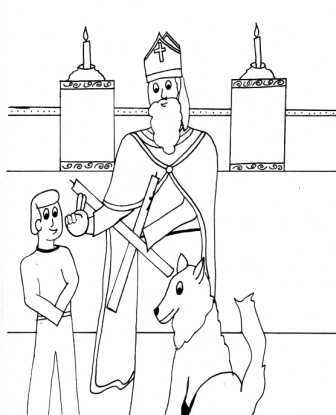 This week we have coloring pages of Saint Blaise and Jesus performing miracles. Enjoy! What a wonderful site you have! I can't wait to revisit you each week! 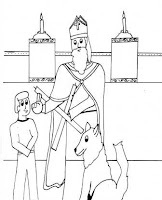 When I printed out the bulletin for this week & next, I noticed that the words that were in the small font as well as the traceable words either didn't print (the tracing ones) or printed just a short, thick bar instead of words (like the Gospel explanations). Am I doing something wrong? They all show up in the pdf that I downloaded, so I'm just going to read that to the kids & let them color, but I hoped that for future issues I could fix my problem :-) Thanks again for such an amazing idea!!! Love this site! Hmmmm, I am shockingly clueless about PDFs, but I just tested it out and it worked so I'll tell you what I did. If this doesn't work for you, I really have no idea. But, let me know if it doesn't work and I'll do some research. I clicked on the link above the embedded document which took me to the document on scribd. Over on the right side of the page, there is a print option so I clicked that. It required me to download the document, so I downloaded, opened, and printed. Good luck!